4 Roles Your new extension is now installed. 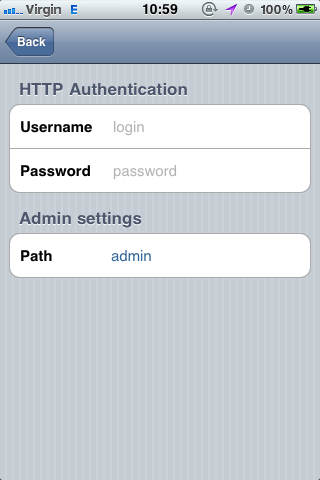 You need to configure a new role and a new user for the mobile app. Technically, you can use the main administrator login on the mobile app, but if you do several mistakes entering your password (which can happen on a small phone keyboard), you take the risk of locking your account. To avoid this issue, and for security reasons, it is recommended to create a new role, Dashboard for example, and a new user with only this role. You can configure roles in System / Permissions / Roles. The new role needs only two permissions : Dashboard Mobile Dashboard You are now ready to use the mobile application. 5 Updating Updating the extension is easy thanks to Magento Connect. Login to your administration interface as an administrator and go to Magento Connect Manager : You will then have to login again as described in installing section of this manual. Then you will see usual Magento Connect interface (depending on Magento Connect version: 1.0 or 2.0) with Check for Upgrades button in Manage Existing Extensions section: Please note that to use beta versions of extensions (if you'd like to test) you'll have to change Magento Connect setting named Preferred State: to beta on Settings tab: Here is prefered state option you have to change in order to use beta versions of this extension: If Magento Connect find a new version of the plugin, you will be able to update it. Here is upgrade tips from Magento wiki ( ): How to upgrade specific extensions: 1. For each desired extension upgrade choose Upgrade in the dropdown 2. After successfully upgrading click the Refresh button that will appear under the console frame. 3. Then you'll need to flush cache as described in Flushing Cache section of this manual. Now you have upgraded extension. 9 This page lists the 10 most search terms on your store, as well as the number of results associated with them. 12 The orders screen allows you to check the last 10 orders. You can simply touch an order to get its details. Touching the Products line will get you to all the items of the order. Top Sales This page lists the 10 bestsellers of your store.